Gives his idols enthusiastic ovation while surrounded by miserable home fans. 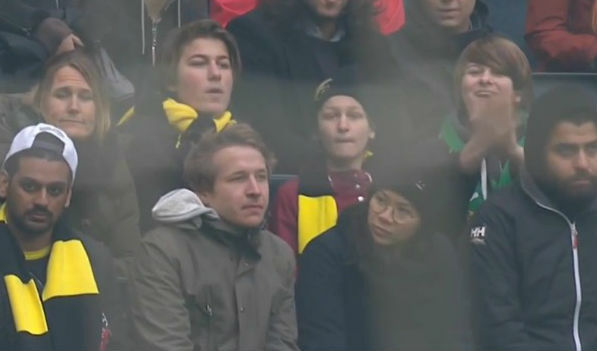 Watch the moment a young Hammarby fan in the home end claps his team’s players for winning 2-1 at AIK in the Stockholm derby. In a move that only a child could have gotten away with, the young supporter gives his idols an enthusiastic ovation despite being surrounded by miserable-looking rival fans. Nils-Eric Johansson gave AIK a 14th minute lead at the Friends Arena, with Arnor Smárason equalising for Hammarby just four minutes later. A Pa Dibba strike in the 79th minute won the day for the visitors, and one kid just couldn’t hide his delight despite what might have been advisable. The result leaves AIK and Hammarby level in the Swedish Allsvenskan table on four points each after three games.